An old man and a middle aged married woman start writing letters to each other due to an error, as unlikely to happen as one in a million. That is the tale; the rest is detail. And as someone wise once said, God is in the details. When I was very young, I used to visit my father’s office. An old govt building filled with wooden tables, netted S shaped chairs and almirahs brimming with sarkari files. In those days, they didn’t have computers; everything was noted manually and was arranged properly in files that used to eat dust for the major part of their lives. Those files were rarely opened, and little cared for. It was as if they didn’t exist. But nobody ever tried disposing them of or even dusting them. They were there, in a secluded corner, containing years of data, stories, facts, and a little anger towards someone who once cared for them enough to keep them in a safe place but then moved on to attend other important things. 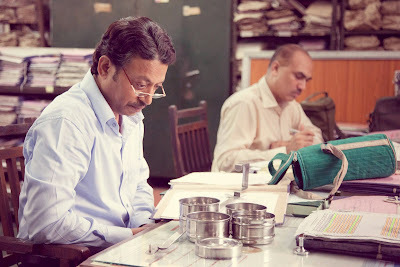 Saajan Fernandes, Irrfan’s character in Lunchbox, is like one of those files. An insignificant human being working as an accountant in a huge firm surrounded by people who don’t care much about him and he couldn’t care less about them. He hasn’t made a single mistake in his 35 years long job. He is about to retire. His life is running like clockwork. His wife is dead, he is childless and he has absolutely nothing to look forward to. He might as well be dead. Oddly enough, the scenes depicting his day to day life reminded me the drudgery shown in “The Woman in the Dunes”, only this time the sand pit was the city I hate so much but can’t stop myself from falling in love with each time it’s shown with all its chaotic beauty on screen, Mumbai. His life changes one day when he accidently receives a wrong ‘dabba’. We get to know, through his letters to Ila, that behind those deep, sad big protruding eyes, there resides a human being who had lost touch with his own soul. A human being you wouldn’t bother to look twice at in a packed train or bus. A human being who is too ordinary to be a hero of any story. A human being who hasn’t been dusted for years. There are so many Saajans around us, and so many of their stories are tragedies with grief too deep to be contained. We are insulated from these tragedies, by our own selfish narcissistic nature, and by the repetitive nature of these tragedies, the shape and form of those stories we have come to be so familiar with. What Lunchbox does is that it puts a microscope between one such tragedy and our eyes. It shows us so much with saying so little. It beautifully captures the extra-ordinariness of an ordinary life. It shows us the loneliness of a man in the most crowded city in the world. It shows us his reluctance to let people in and then his awkward discomfort in accepting their importance once they have inhabited a small part of his life. It makes you feel like reaching out to the man and give him a shoulder to cry on despite knowing that he will never accept it, not because of the fear of embarrassment but because he has long forgotten how to do it. A man and a woman fell in love while writing letters to each other. Put like that it seems so simple. You may fill in the details from your own experiences and imaginations. A story as unoriginal as any other, and as unique as any other life! Thankfully, Ritesh Batra imagined this tale so vividly and chose three of the finest actors of our times to enact it. The screenplay is such a brilliant display of craft for it makes you laugh and moist your eyes at the same moment, mostly without the help of any background music or dialogues. There is a scene in the film where Nawaz says to Irrfan – “Iss country me talent ka koi value hi nahi hai sir.” I couldn’t resist smiling at the irony of that dialogue happening between two of the finest actors of our generation. Go feast on this sumptuous treat and value the talent of these three brilliant actors in this heart crushing tale filled with insane hope, not just for its characters but for our country’s cinema as well. Thanks Avinash.nice and deep review on Irrfan and the story(Love occurs in loneliness). The trigger has been pointed before as well where level of curiosity is much much higher where accidental meet is writing and you never seen each other. Awesome review of the movie.. This review is like an Achaar to the Full Mean Movie...short and adds a definitive value to its flavour...Avinash, you should write more..seriously...and I seriously mean, that you should write 'more seriously'..keep it up! Kudos! !